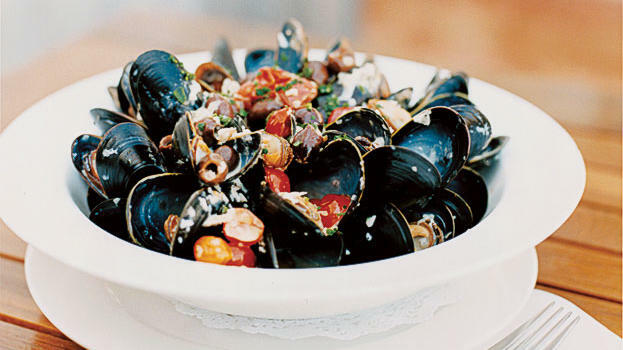 Right off Schoonmaker Beach, try the mussels at Le Garage French bistro. Check into Cavallo Point, the Lodge at the Golden Gate, the first major new luxury hotel in a national park in years (from $250; cavallopoint.com). The Fort Baker fishing pier is a 10-minute walk toward the bridge, past the resort and the Coast Guard station. You’ll want a bike or a car to get to the Fort Baker fishing pier, which sits in the shadow of the Golden Gate Bridge and has unbeatable views across the bay to San Francisco. In summer, foghorns bellow loudly from here, but in December, fishermen and pelicans are more the order of the day. A short walk north is eco-luxe Cavallo Point, the Lodge at the Golden Gate, which was big news in town when it debuted last summer. Even if you don’t stay there, stop for a glass of wine in the clubby Farley Bar. Loop back for a glass of wine at Farley Bar ($$; at Cavallo Point, 601 Murray Circle), then have dinner in town at Sushi Ran ($$$; 107 Caledonia St.; 415/332-3620). Drive to the Marin Headlands for an early hike to Black Sands Beach (download a map at ), then get a friendly “Ciao” with your veggie frittata during brunch at Poggio ($; 777 Bridgeway; 415/332-7771). In the afternoon, wander the galleries and shops on and around Caledonia Street: Flying Oliver Books (215 Caledonia; 415/332-1532), McCloud Design (closed Sun; 1201 Bridgeway; 415/331-2178), Pinestreet Papery (421/2 Caledonia; 415/332-0650), and Sausalito Picture Framing (closed Sun; 310 Caledonia; 415/331-3567). Then watch the sailboats from Schoonmaker Beach (at the end of Liberty Ship Way) and dine at Le Garage ($$$; 85 Liberty Ship Way; 415/332-5625). Take in Sausalito coffee culture at Caffe DiVino ($; 37 Caledonia; 415/331-9355) before exploring the houseboats at Waldo Point Harbor (at the end of Gate Six Rd. ; ). Afterward, browse tableware at the Heath Ceramics factory store (400 Gate Five Rd. ; 415/332-3732), then walk across the street to Fish ($$; 350 Harbor Dr.; 415/331-3474) to fuel up on Dungeness crab rolls and fish tacos.